Check out all our range of pastel dresses for dance competition. Mademoiselle Danse selected for you the prettiest outfit among the biggest specialized brands. Several options are available in the pastel dresses category, to best meet your expectations. Do not hesitate anymore, it’s here that you will find the ideal dress to participate to your competition, in group or in solo. Subscribe you right now on the website to receive all our offers by email and order your dance leotard in a few clicks. You can contact us at 09 54 61 48 85 or by email contact@mademoiselledanse.com, we will be happy to give you our advices! Degas dress leotard with thin straps.Gathered front and back neckline.Princess and underbreast oversewn seams.Stretch tulle skirt with V cut.Unlined.New lycra. Degas dance leotard with thin straps.V cut front neckline and cross staps in the back.Stretch tulle veil that goes from the breast to end skirt like.Entirely lined in the front.New lycra. Tunic for girl with large elastic straps.Rounded neckline front and back with large elastic to suit perfectly to the dancer.Small flounces on shoulders.Short skirt in the same fabric as tunic's body. Dance tunic Wear Moi Limited Edition large straps.Round neckline on the front and right on the back.Lace yoke under the chest, on the back and on the straps.Short skirt in stretch tulle Entirely lined on the front.Microfiber. Mademoiselle Danse likes: the lace. Thin straps dress leotard.Rounded neckline front with floral detail.Elegant and comfortable.Full front lining.Microfiber.Skirt in stretch tulle. Mademoiselle Danse likes : the pastel color. Dance tunic without sleeves and the skirt integrated.Round neckline front and large opening on the back.Game of microfiber fabric and openwork tulle.Entirely lined on the front. 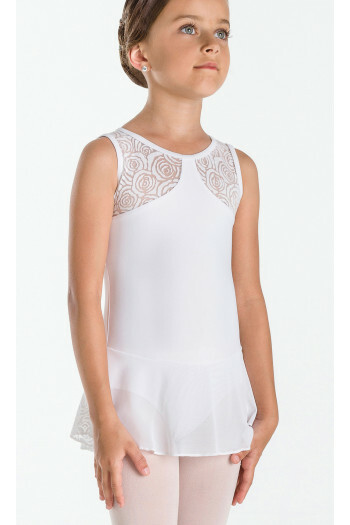 Mademoiselle Danse likes: the openwork tulle very classy! Dance tunic with wide straps and its integrated skirt.Neckline ruched front and a curved back.On sting in the chest and middle back.Fully lined front.Microfiber skirt and tunic.Mademoiselle danse likes: material and gather at the chest level that makes a beautiful neckline. Dance tunic large straps with its skirt integrated.Pleated neckline front and round back.Topstitch on the breast and at the liddle of the back.Entirely lined front.Skirt and tunic in microfiber. Mademoiselle Danse likes : the fabric and the gather on the breast which makes a real beautiful neckline. Spaghetti dance tunic with its integrated skirt.Gathered neckline front and fully lined to right behind.Microfiber leotard and skirt in stretch tulle. Mademoiselle danse likes: its sweet price! Large straps dance tunic with its integrated skirt.Gathered neckline front and fully lined to right behind.Microfiber leotard and skirt in stretch tulle. Mademoiselle danse likes: its sweet price and the quality!